One of the recurrent questions that we get at the Biomarkers team at tebu-bio is on what controls should be included in a given experiment. Either if the experiment is done by researchers in their lab, or if we collect their samples and perform the analysis in our lab, a good design starts by using the most convenient controls. One of the controls is related to the study itself. In this sense, definition of what a control population is, and how we want to study it vs. a cohort of patients has been discussed elsewhere in a proteomics post. Today, we will put our spotlight on the “technical” controls, i.e. those related to the technique itself. Obvious. We need to check that the technology we are using is able to detect what we want to detect. And before starting with unknown samples, we need to check that it works in samples we know well. Ideally, a positive control should be as similar as the samples we want to analyse. In this sense, samples for a given health state (be it with a disease or not), are commercially available, or they can be found if not yet available. tebu-bio has a network of collaborations with private companies that can provide validated samples, fulfilling all ethical and clinical criteria. Background can be an issue…only if you are not able to detect it. If you can see it, then you can either modify your protocol, or discard that sample. Picture shows an example of what can be seen with slightly-hemolysed plasma. Alternatively, we can use recombinant or chemically synthesised controls. If we take the example of recombinant proteins (either in pure form or spiked in biological samples), there are many which are commercially available, or they can be made upon demand. Here it is important that the recombinant protein is very similar to the one found in an organism, including glycosylations and other post-translational changes. In this sense, for many control proteins, HEK293 is preferred over E.coli as an expression system. Water. Or PBS. Or not? Commercially available samples mentioned previously can be a good approach. For immunological studies involving cell culture supernatants, it is important to include a control with the culture medium only, as FBS can affect the specificity of the assay and can render false-negatives due to background. Background due to FBS is not detected by technologies such as ELISAs or bead-based, whereas it is detected in optical-based technologies such as arrays and Q-plex. Every technology has an inherent coefficient of variation (CV). Genomic technologies usually are under 5 % CV. 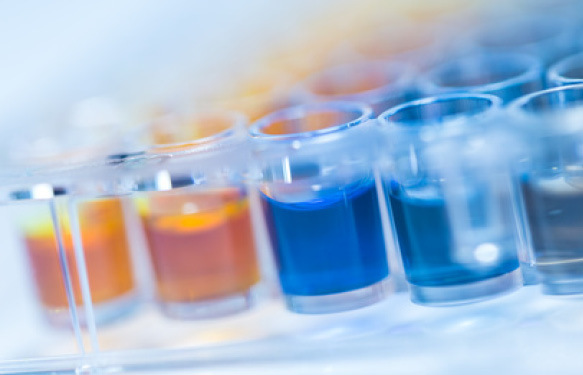 Immunoassays are around 10 to 25 % (or even more). This means that, for some biomarkers where the difference between healthy vs. disease is small, CV may hide the relevance of these biomarkers. This is especially dramatic in studies related to signal transduction, where differences are usually very small. 6-plicates in an antibody array. A way to make sure about whether a result comes from real biology or artificial CV is the performance of replicates. Triplicates (or even 4-plicates) have been popular with ELISA users. Nowadays, however, most researchers perform duplicates, and repeat the analysis of the sample if the results are very discordant. This approach is quite practical, and still allows to have accurate results in a sensible way (i.e. not doing 4-plicates for every sample!). Antibody arrays in the market usually have replicates spotted onto the same slide (from duplicates to 8-plicates), which can be considered as semi-independent technical replicates. Therefore, there is no need, in most cases, to perform additional technical replicates. In any case, every project is different, so we are continously advising our customers on what is the best approach for one given study. From its design to the technology best suited to get the best results, we are glad to contribute to the advance of the understanding of biomarkers in several diseases. Wondering what controls to include in your experiment? Don’t hesitate to contact us!